Get a scent of spring with Marc Jacobs, Philosophy and Elizabeth Arden! 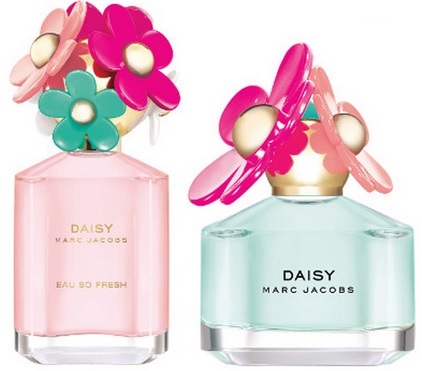 Marc Jacobs Daisy Eau So Fresh Delight - 75ml EDT - $89 - a lush and fruity floral fragrance with top notes of blood orange, pink pepper and white tea; heart notes of tiare tahiti, violet and raspberry; and base notes of apricot skin, musk and amber. Marc Jacobs Daisy Delight - 50ml EDT - $79 - a luminous floral fragrance with top notes of apple, quince flower and freesia; heart notes of iris, gardenia and peony; and base notes of musks, cedarwood and sandalwood. Available now at Hudson's Bay, Sears, Holt Renfrew, Sephora and Shoppers Drug Mart. Philosophy Sunshine Grace - 60ml EDT - $55, 480ml Body Lotion - $44 - a relaxing, carefree and refreshing fragrance to help you think warm thoughts with top notes of bergamot, sparkling freesia and honeysuckle; heart notes of jasmine, orange blossom, tiare flower and fragniapani; and base notes of solar musks and soft blond woods. Available now at Sephora as well as select Hudson's Bay and Shoppers Drug Mart locations across Canada. Elizabeth Arden Green Tea Yuzu - 100ml EDT - $56, 50ml EDT - $40, 250ml Honey Drop Cream - $27 - a sparkling, uplifting feminine fragrance with top notes of yuzu zest, bergamot, sparkling lemon, green tea vapors and lemon tree petitgrain; heart notes of yuzu pulp accord, wild thyme, spearmint, black currant buds, green tea leaves and tunisian neroli; and base notes of musk, white birch and ambrette seed. Available now at Shoppers Drug Mart, Sears, Hudson's Bay, London Drugs, Jean Coutu and Pharma Plus.